You have been desperately awaiting word on the status of my broken finger and splinted hand. I know this to be true. It took me five minutes to type everything up to this point. Due to this fact, this may be the shortest post in this blog’s history. Like, crazy short. You know your girl can talk, but this since this Irish Soda Bread is a pretty uncomplicated recipe, you won’t have to pine for my witty banter. Can you blame me? Look. At. This. Here! The ortho doc changed my splint, so now it’s even more obnoxious. And here we are thinking that wasn’t possible. I’m typing like an orangutan. With a few exceptions, this is all we need to make our loaf of Irish soda bread. Two types of flour, mixed with leavening agents and seasonings. You cut in some butter, add the fruits (I use cranberries), hydrate, then bake. That’s it, blog post is done! JUST KIDDING!!! I wouldn’t do you like that! Irish soda bread is a notoriously rustic quickbread- very similar to a scone or, for you Southern types, a biscuit. While with most breads, a thorough kneading is necessary to produce the optimal chewiness and crumb, there are no such guidelines with this bread. It’s so unfussy, it’s lovable. 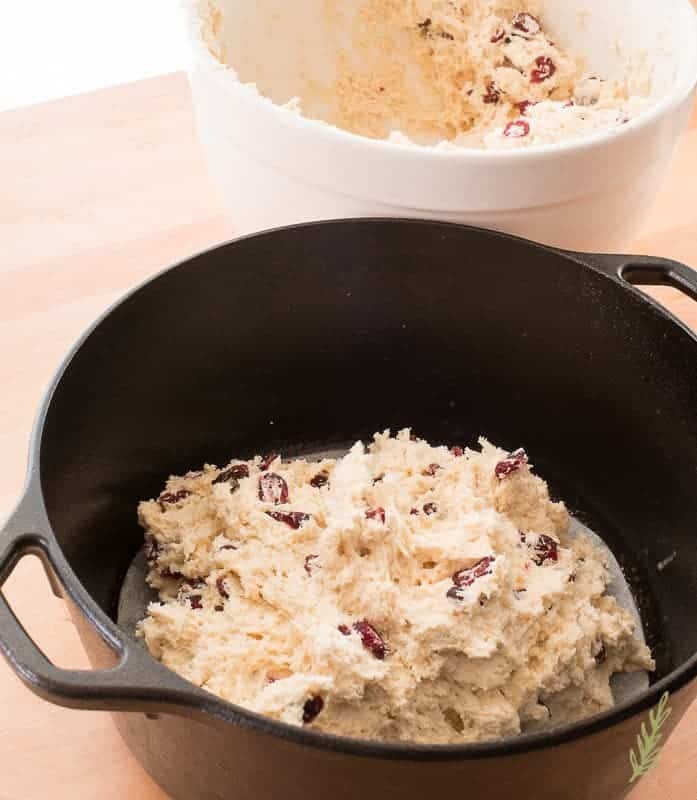 Although the tradition is to bake an Irish soda bread with currants or raisins folded in, I never have the former on hand and my family dislikes the latter. I combine the two flavors by using the humble cranberry instead. Since cranberries not only provide the sweet/tart element we’re looking to achieve, but also clear out any remaining holiday cranberries, it’s a great substitute. Irish soda bread can also be prepared sans fruit, or with caraway folded into the dough. Leaveners, flour, butter, and buttermilk are a must, though- at least for my version. What makes my version legit? The fact that Moira taught it to me. Moira Cavanaugh was the cool redhead before Merida came on the scene (yes, you Pixar nerds, I know Merida is Scottish- it’s just a comparison). Moira lived in Virginia in County Cavan, Ireland. She played the fiddle in the local pub and, later on into the night, in her upstairs room after she left work at the Virginia Park Lodge. She kept me up many nights with that fiddle-music. See that door second from the right? That’s where I spent my time in Ireland. 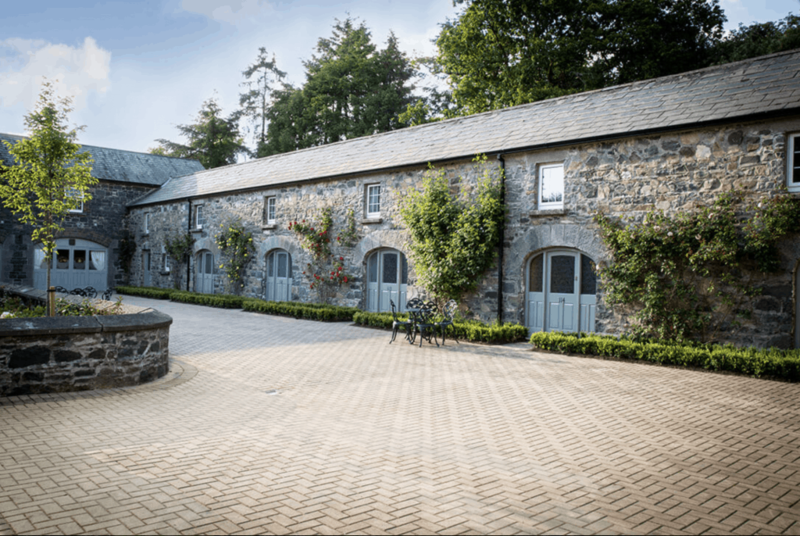 I was actually cheap labor in what was billed as an “exciting opportunity to learn the exquisite cuisine of Ireland.” Even the Irish laughed at me when I told them what I was doing there. Don’t let the image fool you. I saved this from the website. When I stayed there, Bective Court looked nowhere near as charming as it does now. Anyway, I digress. Moira was a cool Irish lass with loads of attitude, so naturally we got on great. It was she who taught me to make Irish soda bread one day while on morning break. Our group always broke for tea in the afternoon and Moira was in charge of preparing the teatime snacks beforehand. Always wanting to learn new recipes, I convinced her to let the Black-Puerto Rican chick help her out. She did, and we became fast- albeit temporary- friends. My Irish soda bread begins with a unique spin on the dry ingredients. Moira taught me to use pastry flour. The main difference between flours is the amount of protein each contains. Bread flour has a relatively high protein content which is why it creates chewy, dense loaves of bread. Cake flour has a considerably lower amount of gluten protein which is why it provides cakes, and cupcakes, their lighter crumbs. Pastry (or all-purpose flour) falls right in the middle of these two flours, so using it is perfectly fine. For me, however, I like a lighter crumb than even all-purpose flour can provide, but I still need to maintain the gluten structure of the loaf. While the pan I bake in plays a role, the mixing of both cake and bread flours contribute to the overall success of the completed product. The “soda” in Irish Soda Bread names the only leavening agent that used in most Irish soda breads. As with most of my recipes, mine is not traditional. Why? Well, because, again, I’m a Black-Puerto Rican making it…what’s traditional about any of this? I don’t care much for flat loaves of bread unless they’re intended to be flat. Typical Irish soda breads I’ve had are too flat (for me). Because of this I use, not only baking soda, but baking powder as well. I always combine the dry ingredients together prior to cutting in the fat, or adding any wet ingredients. I talk about why here. Combing them by sifting them together into one large bowl is a great idea. If you’re using fresh, newly opened ingredients, though, whisking them together will suffice. You just want to be sure your dry mix is fully blended and free of weevils or debris. 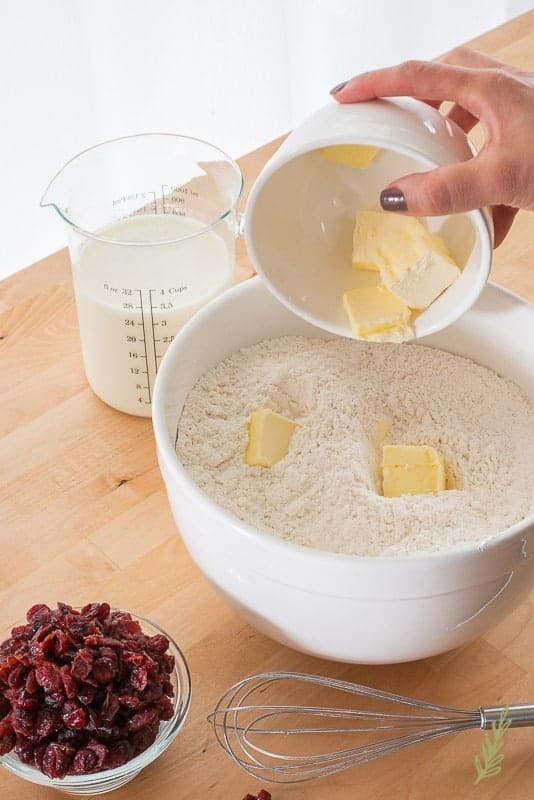 Once you’ve mixed your dry ingredients together, you need to add your unsalted butter. Cut the pats of butter into small pieces by pinching them, along with the flour in between your fingers, or with a pastry cutter. This process is referred to as “cutting in the fat” and it’s important when you want to give rise to your bread products. Your finished mix should resemble coarse meal- similar to a thicker cornmeal. 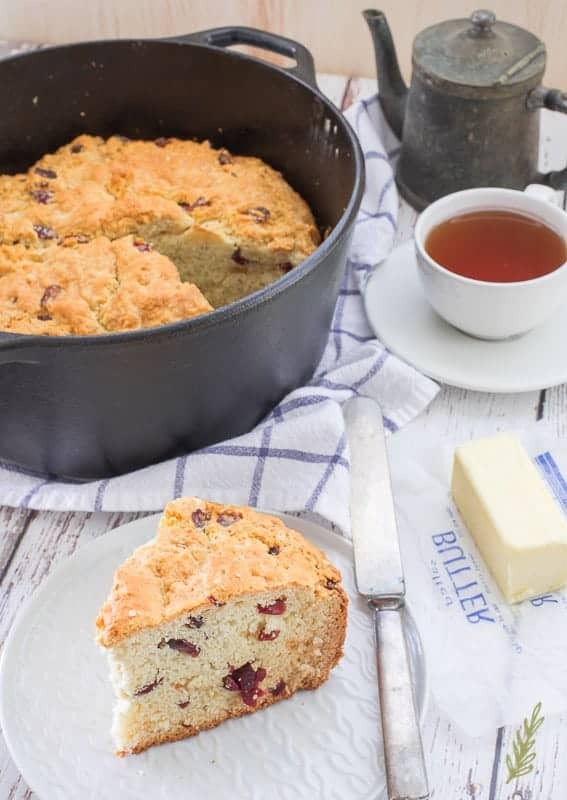 If you’re preparing this Irish soda bread on a warm day, it may be necessary to refrigerate your flour/butter mixture for a bit after cutting in the fat. If your flour is gummy, it means the butter is too soft and needs to be chilled. Just pop it into the fridge for half an hour, or so. 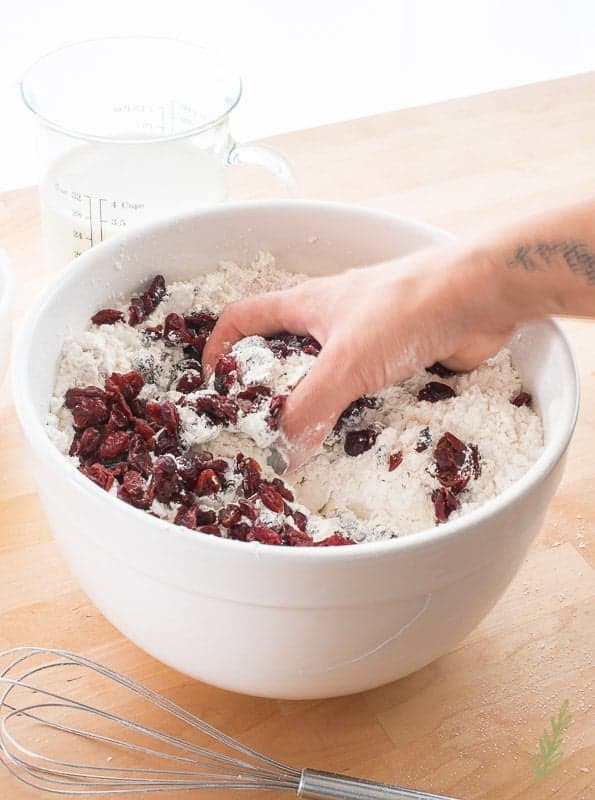 If you’re chilling your dough, now’s a great time to set up your baking vessel. *If not, do it before starting the recipe so it’s ready to use* I like to bake my Irish soda bread in a heavy cast iron dutch oven. In the past, I’ve baked it on a sheet pan lined with parchment paper, and although I prefer the cast iron method better, both produced amazing results. But in order to bake, you need to prep the pan. 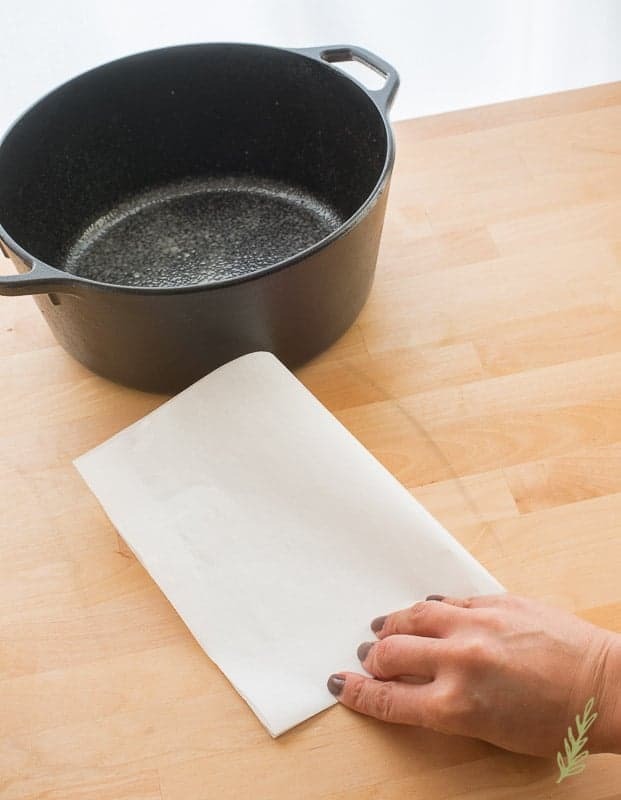 I start with a large piece of parchment paper (11″ x 13″), which I then fold in half. I, then, fold the paper in half again (widthwise). Then I fold the paper to form this…I have no idea what this shape is…the Twins say it’s a trapezoid and since one of them on their own is smarter than me and the Soldier put together; if both of them agree, I’m going with it. The object is to end with a triangle at the tip which we can cut. 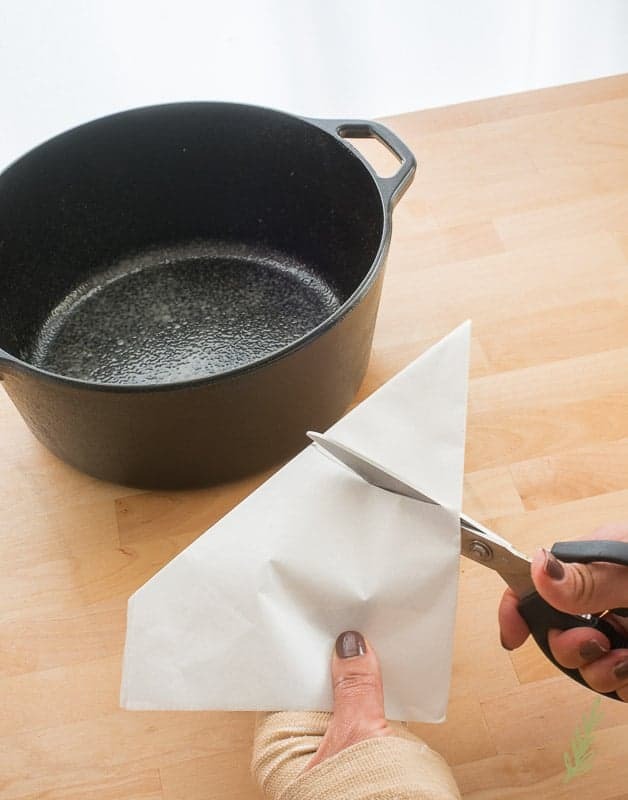 Place the pot onto the triangular end of your paper. Guesstimate where the center of the pot is and position the point of the paper to reach that center mark. 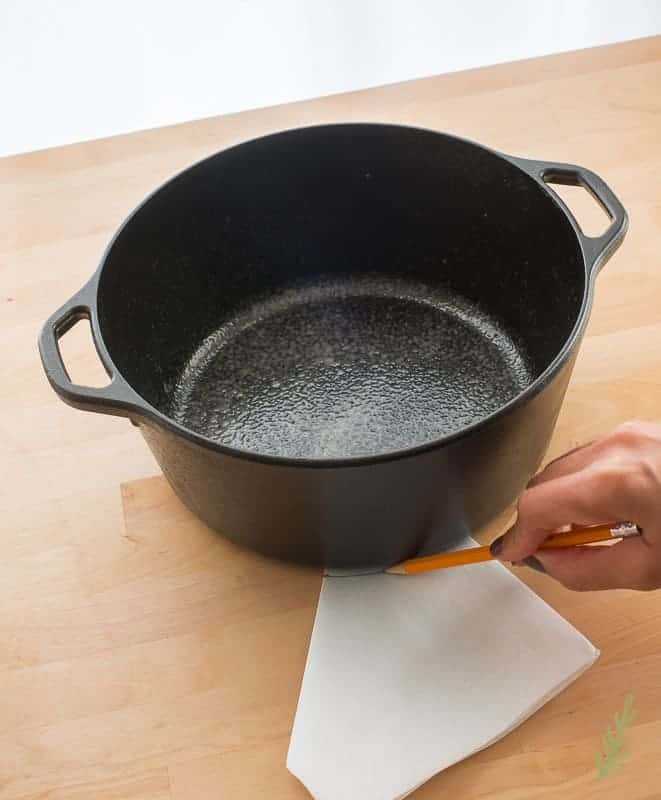 Outline the pot using a pencil. 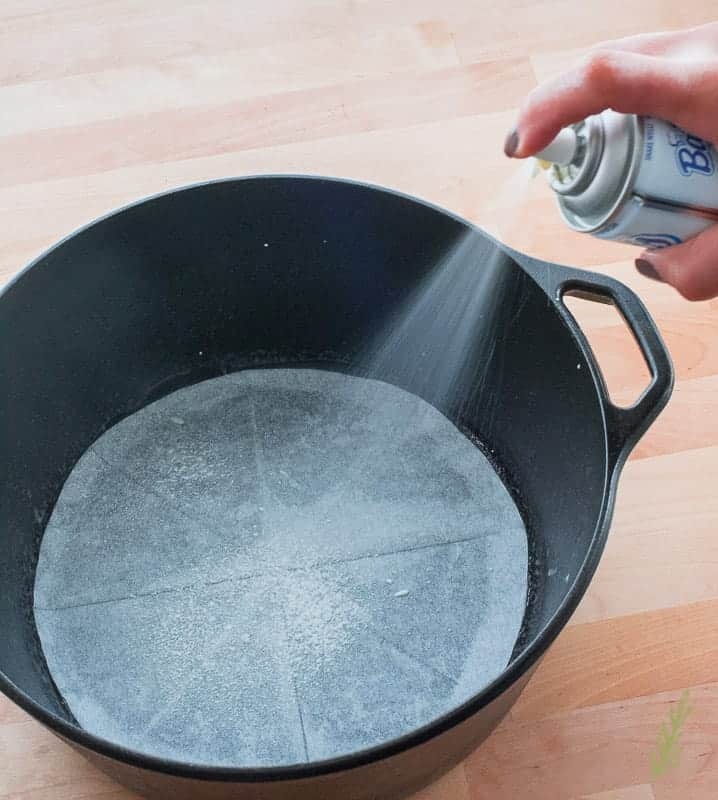 Spray your pot with non-stick baking spray. Unfold your paper and lay your newly formed circle, pencil side down, in your pot. 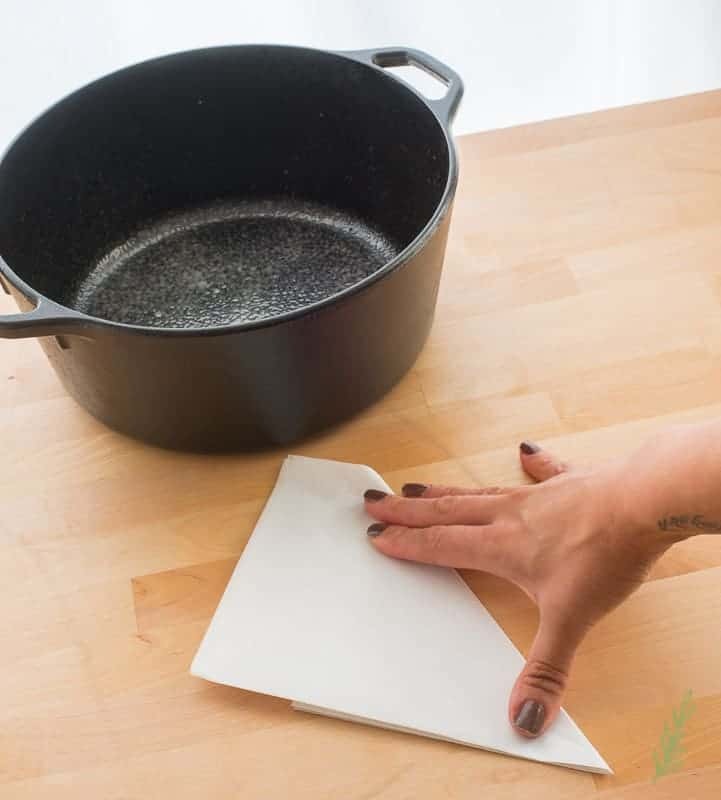 Spray the paper lightly and set the pot aside. By now, your mix should be nice and cool. Add your fruits. Like I mentioned before, currants are the typical fruit used in Irish soda bread, closely followed by raisins. I use cranberries because I’m a non-conformist. 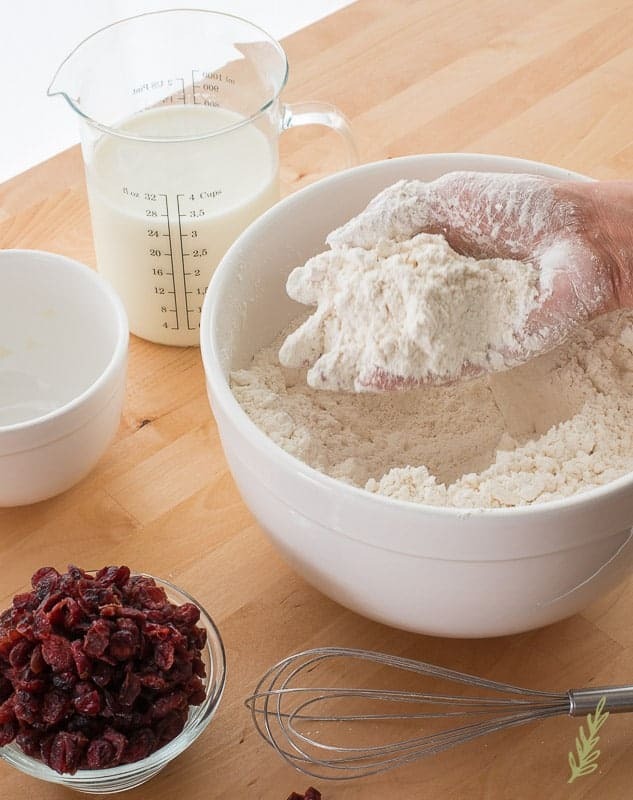 Whichever you choose to use, incorporate them into the flour, making sure to separate any of them that may be clumped together. Pour in your cold buttermilk. Don’t have buttermilk on hand? Don’t fret, my pet. For every cup of milk your recipe calls for, stir in 1 tbsp of white vinegar or lemon juice to make your own buttermilk. Let this sit for 15 minutes and, in the words of Toula’s dad, from My Big Fat Greek Wedding, “There you go!” Add your buttermilk to the flour mixture and fold in until you see no pockets of either milk or flour. 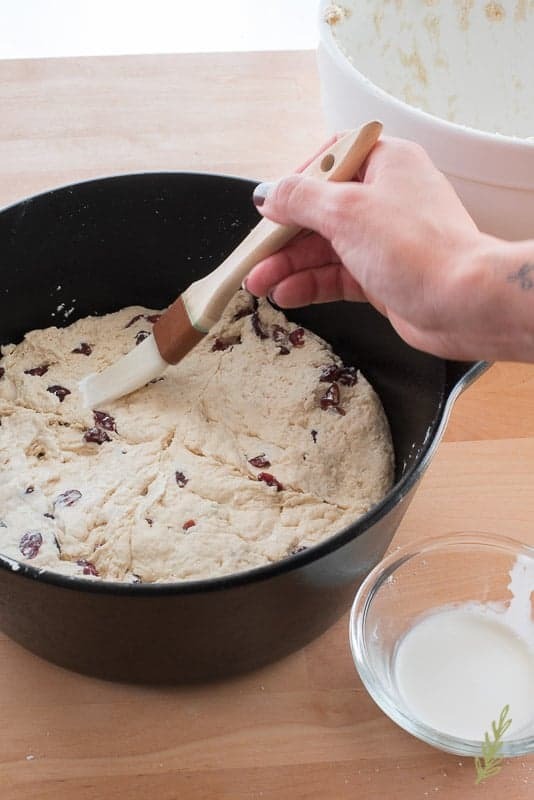 The dough should be well combined, but you also don’t want to over mix. Deposit your dough into your prepared pot and pat down so it has a level surface. Grab a very sharp knife, lame, or razor blade, and score (cut) a deep cross onto the surface of the dough. Make sure cuts are deep (about a 1/2″ deep). Working with one hand had me caught up so mine wasn’t deep enough. Boo. All that’s left to do is brush down the top of dough with a light glaze milk, using a pastry brush. Now place the pot, carefully, into your pre-heated oven and bake until the loaf is golden brown and sounds hollow when tapped. Remove the pan from the oven and allow to cool, in the pan, for 15 minutes before slicing and serving. Typically, the loaf is good for up to 48 hours, but you can most certainly wrap and freeze it for up to two months. Bread never lasts longer than a couple of days around here, but I’m almost positive the bread will taste great up to 3 days. I, personally think the best way to enjoy Irish Soda Bread is slathered with honey-butter and bit of jam, along with a spot of tea. I do hope you get around to making this and experience a bit of my Irish adventure through food. Hopefully, if I make this couple more times, the “the luck o’the Irish” will come visit me. 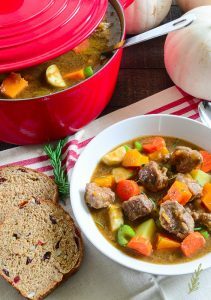 Pin this recipe for later and let me know how you liked it! 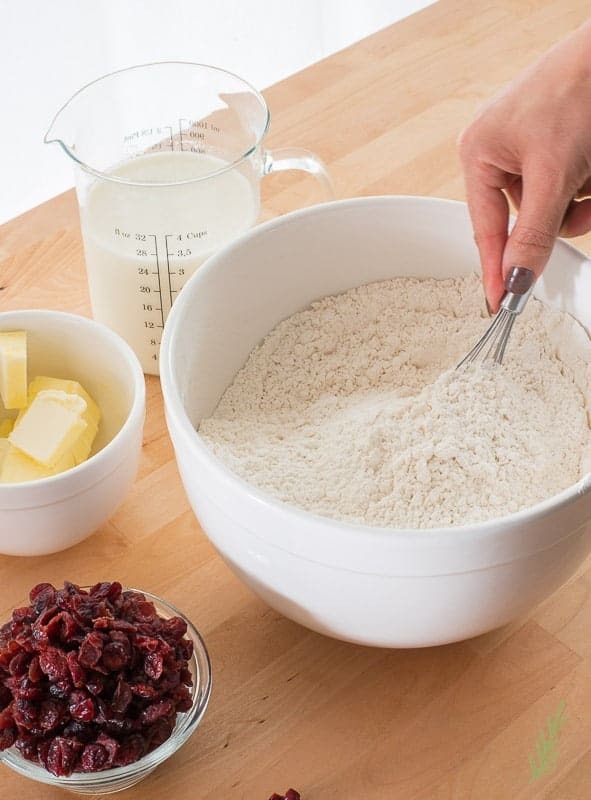 Substitute currants or raisins for the cranberries or omit altogether. Preheat your oven to 375°F. Lightly spray a 5 qt cast iron dutch oven with non-stick baking spray. Follow instructions in post on how to prepare a pan liner. 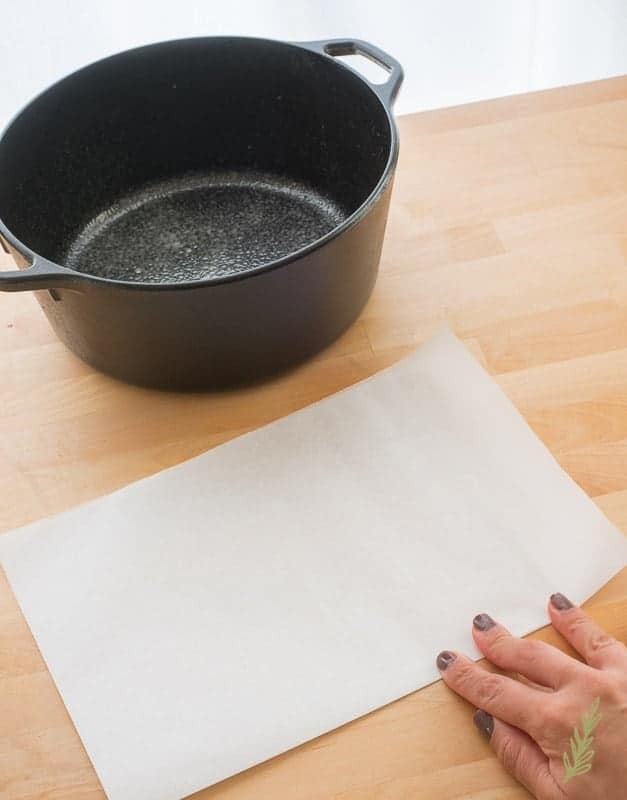 Alternatively, line a sheet pan with parchment paper. Set aside. In a large mixing bowl, combine all the dry ingredients and the caraway seeds (if using). 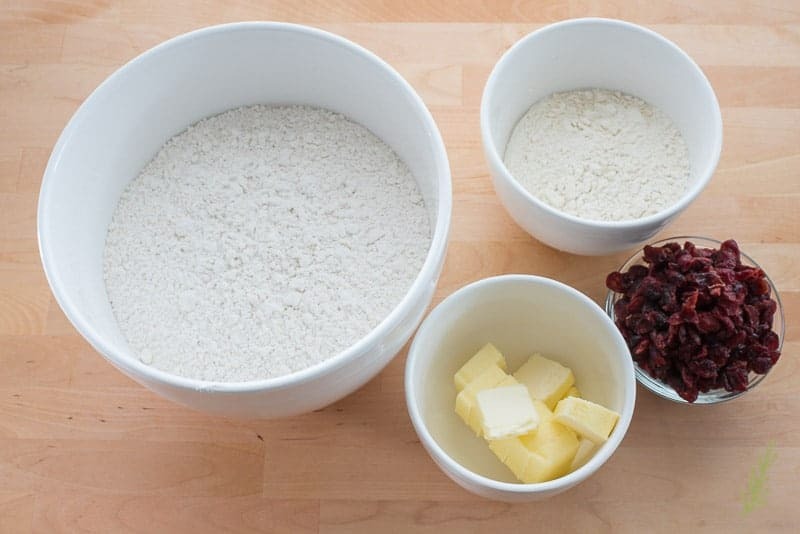 Add the butter and cut it into the flour until the mixture resembles a coarse meal. Add the cranberries and mix well. 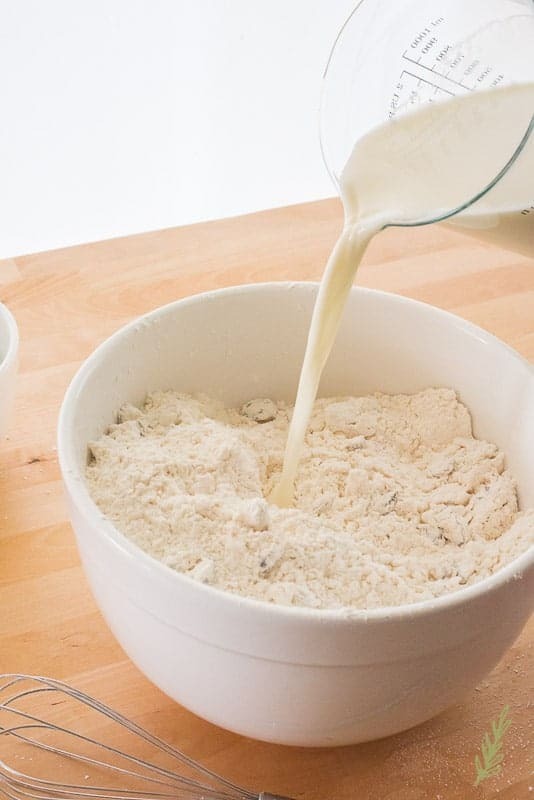 Pour in the buttermilk and mix until there are no more pockets of flour or milk. The mix should be fairly sticky but still able to hold its shape. 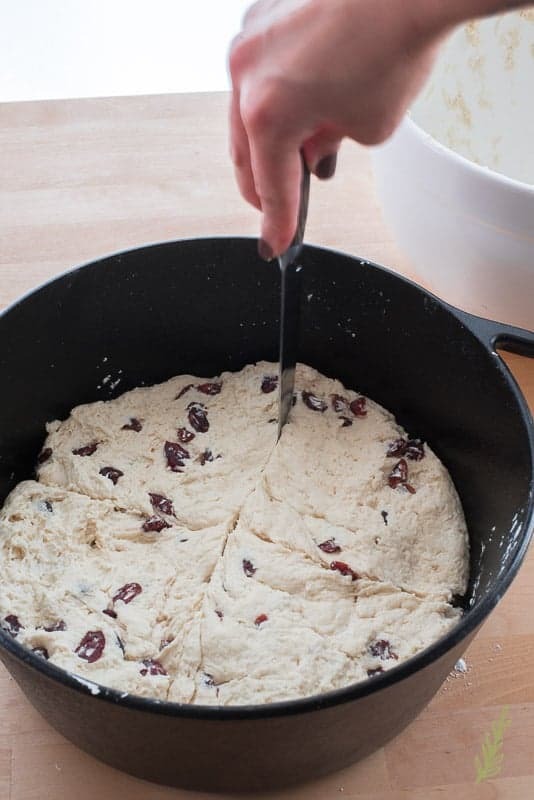 Place the dough into the prepared pan and pat down to create a level surface. Cut a cross onto the dough's surface using a very sharp knife. Brush the milk onto the surface of the dough lightly. Bake for 35-40 minutes, or until golden brown and sounds hollow when tapped. Remove the pan from the oven and allow to cool, in the pan, for at least 15 minutes before carefully removing from the pan, slicing, and enjoying. Wrap the bread in plastic wrap to prevent the loaf from drying out. The bread will keep well for up to 2 days, or freeze completely wrapped for up to two months. 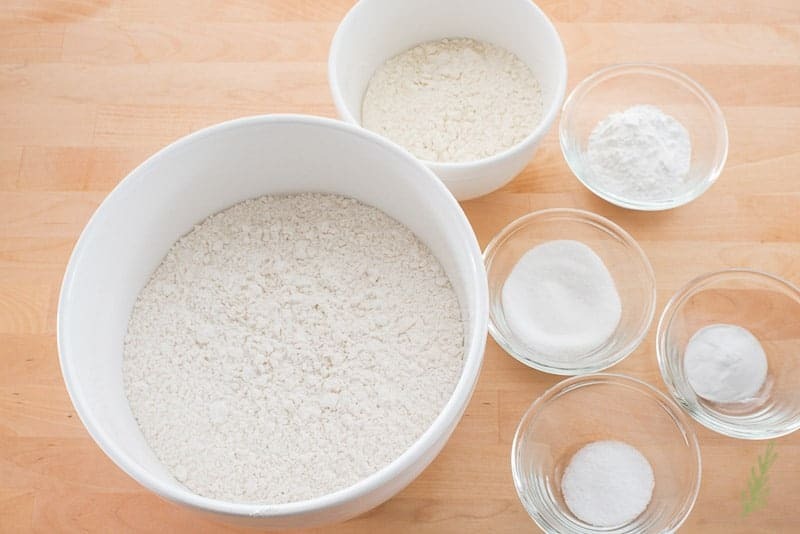 substitute all purpose flour for the cake and bread flours, using the same total amount. I can not wait to try this! And your poor hand! Quick healing vibes to you!!! Thank you so much, Alice! I hope you enjoy it! I have never heard of Irish soda bread before but this looks delicious!! Really, Emily? Well, I’d be honored to be the one to introduce you to it! I hope you give the recipe a whirl! 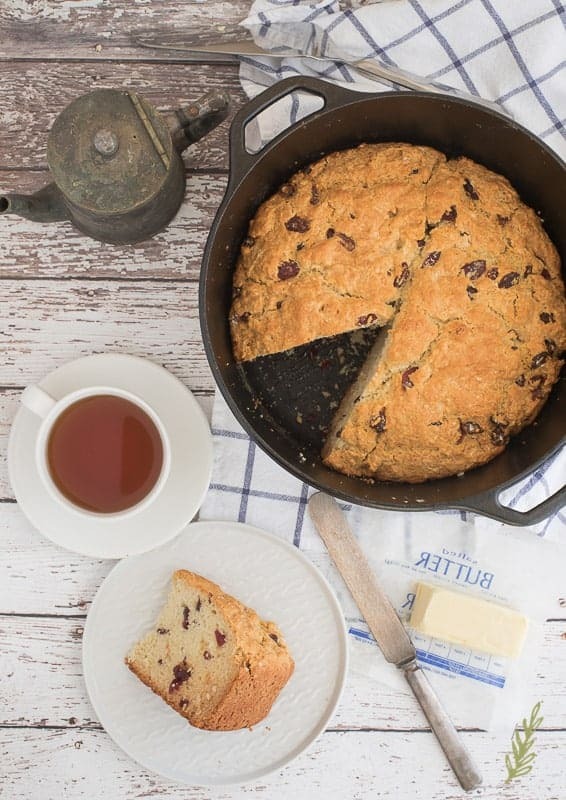 I love Irish Soda Bread and I’m so jealous you learned to bake in Ireland! Dream! I’m not much of a Chef but this seems simple enough! I could try this out before my friends’ St Pattys function. Hopefully it turns out well. This is certainly a straightforward, simple recipe… and you can never have too much bread, so do a trial run. Have fun! Your pictures look amazing! 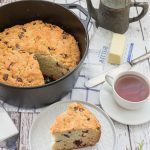 I have never tried making Irish Soda Bread – but your recipe does look super easy AND delicious. I’ll give it a try this St. Patrick’s day. Thank you! Thank you so much, Autumn. I’m really falling in love with food photography. I think if there’s ever a recipe to start baking bread with, this is it. I love the simplicity and “unfussiness” that you mentioned! Sounds like my kinda recipe, haha! I hope your finger is feeling ok! The finger is still the bane of my existence right now, but thanks for asking! And, yes, I love simply and unfussy every once in awhile. I’ve been craving Irish Soda Bread lately. This is going on the list to make next weekend! Those cravings are funny, aren’t they, Caroline!? My family has a hard time understanding why I simply “must” bake bread at eleven pm sometimes. 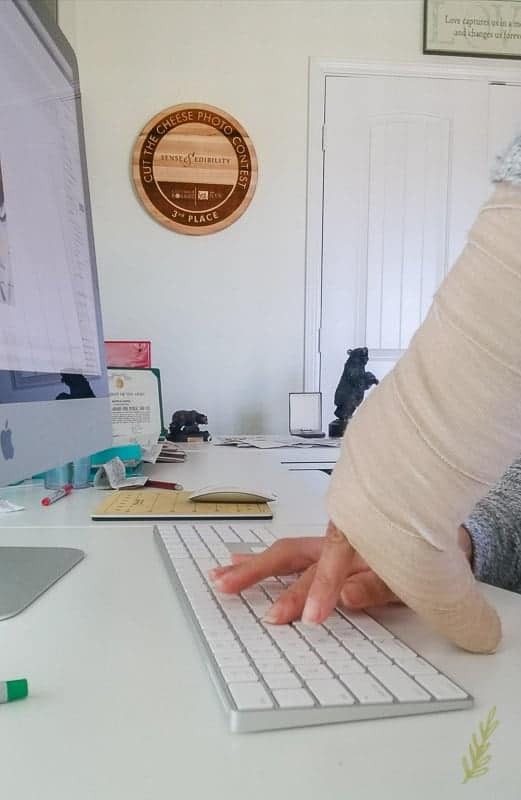 OMG – I hope your hand heals fast!! This recipe looks great! Thanks, Erica! Three weeks left in this God forsaken splint! omg your poor hand!! I hope you heal up ASAP.